Many of the hotel's 40 guestrooms and suites include private Jacuzzis and balconies, gas or wood-burning fireplaces, and supported featherbeds overlaid with luxury linens. For over two decades, the Smokehouse Restaurant has maintained its legacy as a culinary destination with exquisite ingredient-driven cuisine. Venture outside to the property's peaceful gardens, tennis, outside pool, volleyball, and croquet courts for some fun recreation on the grounds. Special touches elegantly arranged throughout every stay will make the experience that much more special. 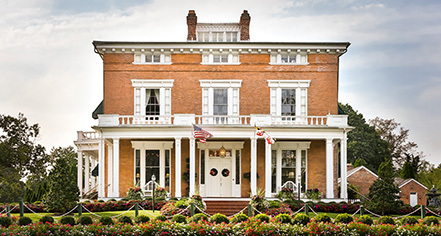 Located just 15 minutes from Gettysburg, Antrim 1844 is the perfect location for romantic getaways, exquisite fine dining, elegant weddings, family reunions, corporate meetings, retreats, and more. 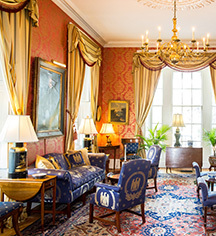 The hotel is within easy reach of three major metropolitan areas: Philadelphia, Pennsylvania; Baltimore, Maryland; and Washington, D.C.
Antrim 1844, a member of Historic Hotels of America since 2007, dates back to 1844. General George Meade stayed on this historic property on the night of June 30, 1863 during the Civil War. He had been the Commander of the Army of the Potomac for only two days before fighting erupted. General Meade went on to defeat Robert E. Lee at Gettysburg and earned notoriety as one of the most important commanders of the Civil War. "The Meade Room" is named in his honor. Pet Policy: Pet-friendly rooms are available. Please notify request at time of booking. Nestled at the foot of the breathtaking Catoctin Mountains in Central Maryland, the beautiful 24-acre Antrim 1844 estate is renowned for its superb cuisine and upscale accommodations. Owners Richard and Dorothy Mollett have masterfully restored the property to reflect its original splendor of 1844. Learn more about the History of Antrim 1844 .